Who was that lady in your office today? Yeah, Dad, who was that lady in your office today? I don’t know. Just some lady. Halloween night. All channels are stuffed with horrors to entertain you during this scary night. Unfortunately these are always the same recurring wellknown movies (I’m sure the budget of the Film Department isn’t that big). Best I choose one from the seemingly endless list of never watched horror movies. And I always wanted to watch “Oculus” (despite some negative comments I’ve read). And I must say, I was still pleasantly surprised. Not because of the horrifying or frightening content since that part was almost missing completely. But it was because of the ingeniously interwoven storylines from the past and the present that fascinated me. Although it caused a huge muddle in the end. At some point I was so confused, I didn’t even know in which time cycle the story took place. The mirror is a very popular prop in horrors (a nice compilation of famous “mirror scares” can be found here). Personally, I really liked the way a mirror was used in the film “Candyman. 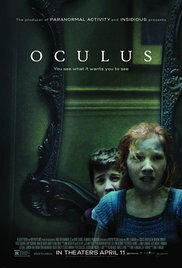 In “Oculus” apparently an old, antique mirror is the source of all sorts of situations that get out of hand. Only one could ask whether or not this mirror is causing people in this particular family to see delusions. Or is it just a genetic disorder? And because of that disorder the psyche of those persons start mixing illusions with reality. And that’s the sophisticated part of this movie. The intertwining of reality and illusion. Are there indeed dark forces hiding in this mirror? And are these forces encouraging an individual to commit heinous acts? Or are those personal delusions playing a major part? Are Kaylie (Karen Gillan) and Tim Russell (Brenton “Gods of Egypt” Thwaites) both victim of the so-called “fuzzy-trace theory”? After many years, it’s Kaylie who comes up with a plan to prove that her father wasn’t the one who tortured and murdered their mother, but that he was manipulated by the evil mirror. Her brother Tim just spent 10 years in a psychiatric institution to get all his facts straight and heal from the trauma he experienced after putting a bullet through his father’s head. Apparently that doesn’t seem to bother Kaylie. She drags him back to the family home where she installed the dreaded mirror surrounded by cameras, electronic gadgets and a security system with an iron pin. She’s determined to film the psychic influence of the mirror and put a halt to the infinite series of mysterious deaths by destroying the evil mirror. Tim throws in all sorts of counter arguments. Kaylie thinks it’s all crap what he’s saying and blames it on the years of confinement and indoctrination by the treating psychiatrists. Or is Tim healed after years of therapy and he got rid of the notorious familial mental state? “Oculus” isn’t about creepy or bloody situations. It’s virtually never scary. So, there won’t be any nail biting moments. And except the apple incident and a tooth extraction, this film is almost bloodless. Yet I found it exciting in some way. Two story lines from two different periods perfectly alternated, so the whole story is revealed in a slow way. As already mentioned earlier, this is somewhat exaggerated at the end, which in turn can cause confusion. In terms of performances are the teenagers Kaylie (Annalise Basso) and Tim (Garrett Ryan) the most convincing. The way they evolve from carefree youngsters into scared teens, is played beautifully. The horror on their face looks tremendously realistic. The older alter egos were rather one-dimensional. Obviously there’s the tension between them as a believer and nonbeliever. “Oculus” is not really groundbreaking and certainly won’t cause a stir in the horror landscape. 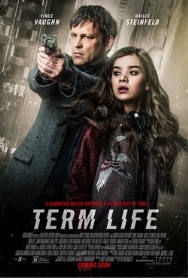 But for horror fans it’s still an enjoyable movie that rises effortlessly above the average. I even dare say it’s a horror for beginners. I’m convinced that they can enjoy a peaceful night afterwards! Even if they take a look in the bathroom mirror while refreshing themselves ….